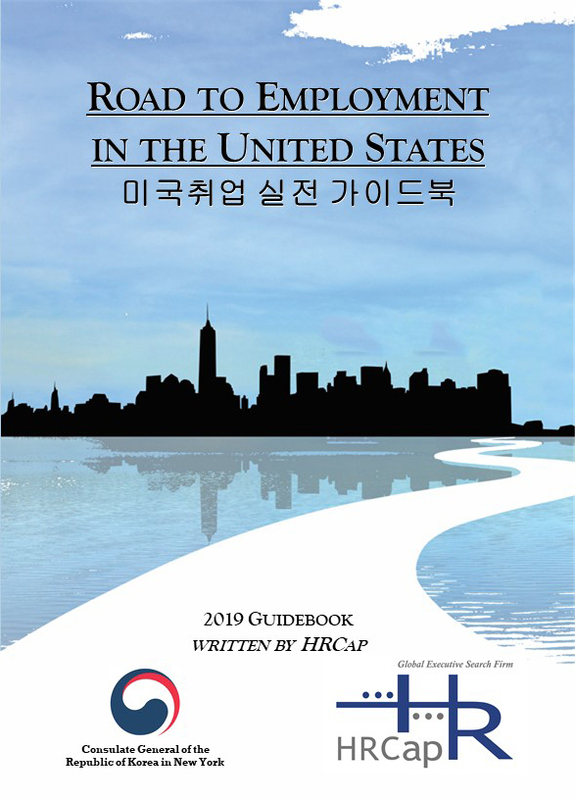 Please contact us directly at career@hrcap.com if you wish to receive a digital copy of the Road to Employment in the United States (미국취업 실전 가이드북) guidebook. For the next couple of months, our newsletters will provide highlights from the 2019 Road to Employment in the United States (미국취업 실전 가이드북) guidebook. We will dive into each step by step guide to employment. The guidebook is an accumulation of the expertise, insights, and know-hows of our CEO Sungsoo Andrew Kim and HRCap's seasoned recruiters and HR consultants. The 150 page guidebook contains both an English and Korean translation of the employment process, that is geared not only to Korean international students, but also for anyone looking for a new job opportunity or career transition. We will first focus on the Preparation and Career Search steps of the employment process. The Preparation for Employment chapter highlights key essentials that will help job seekers started in the employment process, and the Career Search chapter instructs how to leverage and utilize multiple sources for an effective career search. - Conduct a self assessment on your personality and behavioral traits. - Reflect on your "Hard and Soft" skills and further develop them. other for a particular job in specific industries. needed for your desired career path. provide invaluable experiences, especially in the field of your interest. - Mentors will guide you through your career development and help you succeed at your job. career. Keep in mind there is no one perfect mentor or role model. in future job search and career growth. being shared online does not hurt your image or affect your professional brand. explicit, or compromising posts and pictures. 1B, J-1, O, OPT); Three stages of obtaining a work visa. websites contain extensive research and reports that examine industry trends. - *HRCap Tip: Do not limit or focus too much on one industry. Avoid being in industry silos. Develop cross-industry skills to enhance your market value and be in greater future demand. exposure to relevant career opportunities. boards, company websites, or career fairs. advanced searches to yield optimal search results. websites or an online job board. currently open. Certain job positions will only be available through the company's career portal. what each job board offers for your own benefit. - *HRCap Tip: Do not limit yourself to a set number of parameters, and expand your search. Below are important search parameters to consider throughout the entire job search process. - Qualification: the skills and requirements needed for the job. - Location: the geographic area of the job you are searching for. - Salary: the compensation offered for the job. - Job Title or Level: the title or level of the job you are looking for. We have covered the key highlights of Chapter 1 and 2. For a deeper read on these two steps, please contact us directly at career@hrcap.com to receive a digital copy of the Road to Employment in the United States (미국취업 실전 가이드북) guidebook. In our next Newsletter, we will focus on the Resume and Job Application steps of the employment process.